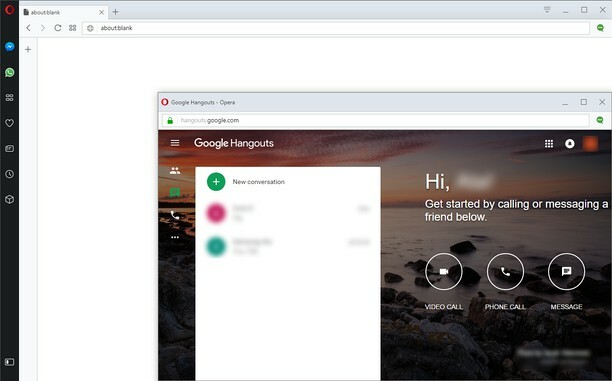 Just opens a new window with a hangouts site. Not much better that a bookmark. All this extension does is open another browser window to hangouts.google.com. It hides the bookmarks bar, but all the other extension buttons as well as the URL bar are still present; they serve no purpose in this context and just take up real estate. I really wish there was an extension to integrate Hangouts into the sidebar. It works, but for some odd reason, embedded images don't seem to be working for me. They just show up as a white space in the text. Fix that if at all possible and I'll happily give it 5 stars. Está muy bien pero me gustaría que se integrara más hacia la barra lateral. After the last update of Opera to version 44.0.2510.1218 (PGO) I'm facing black screen when in call. I have tried to re-install the extension, but didn't help. Any ideas how to fix this ? why do we have all the extra useless space around this new version? The older version was preferable and didn't require such a large window for useless functionality. PLEASE PLEASE PLEASE return this to the way it was last week. There is too much wasted space and is no longer small and compact like before. make it look like the screen shots above PLEASE PLEASE PLEASE. the stupid picture and big buttons and margins around it add nothing and are a nuisance. HOW CAN WE MAKE THIS GO BACK TO THE WAY IT USED TO LOOK?!?! J'ai la version portable Opéra sur clé USB sur mon pc portable pro sous Windows 7 et l'extension ne veut pas s'installer parce qu'elle la considère déjà installé. Parce que j'utilise aussi Opéra sur mon pc portable perso sous Linux. Comment faire ? I mean... it actually pops up in the corner, as opposed to installing the Chrome version but... It would be nice if it was like running Hangouts on vanilla Chrome with desktop notifications. Suggestion: If there's no way to implement it "Chrome-style", would you be able to turn it into a sidebar add-on? Then at least, it would be better integrated with the browser.